Noctilucent clouds, also called polar mesospheric clouds, exhibit thin, wispy light blue forms that contrast with the darkness of space (image upper right). Lower levels of the clouds are more strongly illuminated by the sun and appear light orange to white. Clouds closest to the Earth’s surface are reddish-orange (image center). Image was taken Jan. 30, 2010, with a Nikon D2Xs digital camera fitted with a 70mm lens. 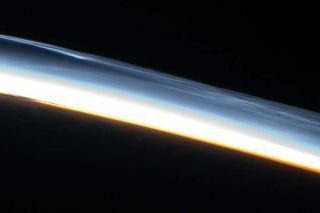 Striking and polar mesospheric clouds, also known as noctilucent clouds, were photographed recently by space station astronauts as the crew soared over the bottom of the planet. While the clouds can be seen frequently from the International Space Station, they are seen only be a few people on Earth because they form over the high latitudes of both the Northern and Southern Hemispheres during their respective summer months. Noctilucent clouds occur at very high altitudes – approximately , or 47 to 53 miles (76 to 85 kilometers). They are most visible during twilight, when the clouds are still illuminated by the setting sun, while the ground is already dark. The wispy clouds range from blue at the highest altitudes to orange and white at lower altitudes that are more strongly illuminated by the sun, NASA explained in a statement. This time of year, the sun never sets over Antarctica, but rather traces an arc across the horizon, allowing polar mesospheric clouds to be observed near local midnight. The image, released today, was made Jan. 30.